Panasonic Lumix DMC-FZ1000 sensor review: Ultimate all-in-one? Panasonic has a long-established range of bridge-style cameras with high-ratio zooms but up to now they’ve all adopted small (1/2.3-in and 1/1.8in) compact camera sensors. This new model, however, is the first from the maker to adopt the physically larger 1-inch type sensor. It’s the same format used by the Nikon 1 system and Sony Cyber-shot DSC RX models, including the recently introduced bridge-style Cyber-shot DSC RX10. Although this high-end ‘all-in-one’ camera is tempting, even with its new lower price of $1,000, the Sony Cyber-shot DSC RX10 is niche-y. It also has a smaller 24-200mm zoom range, albeit with a constant f2.8 maximum aperture. Thankfully the Panasonic is a similar size and at $899 a little cheaper, but it’s far from inexpensive. Apart from the 5-axis optical image stabilized 25-400mm equivalent f2.8-4 Leica zoom and 20.1-Mpix 1-inch CMOS sensor, the FZ1000 is one of the first models to feature 4K video recording at 30fps and adopts other high-end video features such zebra pattern and focus peaking, a slow-motion 120fps 1080p option (to a range of HD video capture modes), 3.5mm mic socket and ‘clean’ HDMI output. The video features are a result of sharing the same four-core Venus processor as the maker’s micro-four thirds Lumix GH4 model but it doesn’t end there, the FZ1000 also adopts that model’s ‘DFD focusing’ system. Based on the defocused characteristics of the lens, this novel system works in a not dissimilar way to the phase-detection systems employed by DSLRs. Contrast detection AF is also used but only for fine focusing. This innovative hybrid system is touted as allowing fast and accurate focus, and it does look promising on paper at least. Naturally, like other bridge cameras it has an EVF, only this is a 0.39” high-resolution (2,359k-dot) OLED type and it has an articulated rear 3.0″ 921k-dot vari-angle LCD. It also features built-in WiFi with NFC for easy image sharing with a suitably equipped smartphone and Panasonic Image app. 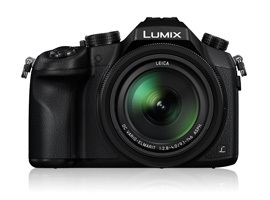 The Lumix DMC-FZ1000 is available now at $897. 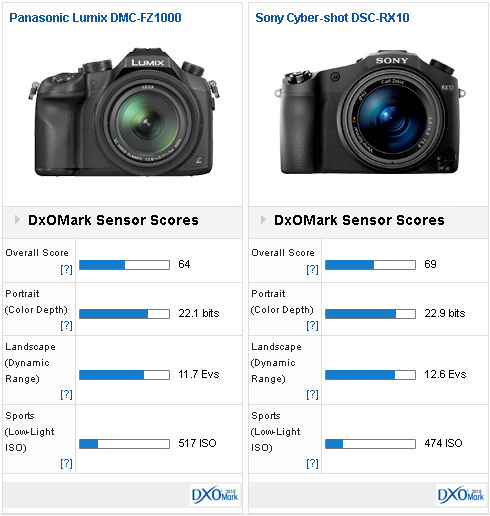 The 1-inch 20.1-Mpix sensor achieved a DxOMark sensor score of 64 points, a good score overall, placing it ahead of rival Nikon 1 models and reasonably close to larger Micro Four Thirds format cameras such as the firm’s 16-Mpix GH4 at 74 points. In this format the sensor is competitive, with 22.1 bits color depth and an 11.7 Ev dynamic range. Low-light capabilities of smaller sensors such as this (compared to APS-C and full-frame 35mm) are somewhat restrictive but the Sports score of 517 ISO is good for a 1-inch type. 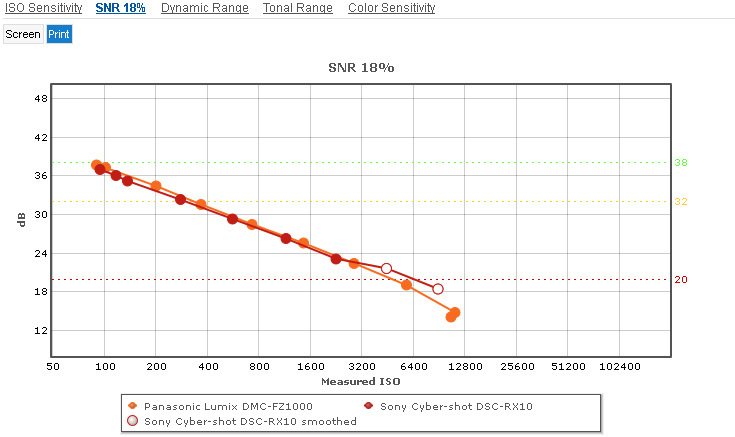 Although the 1-inch sensor in the Lumix FZ1000 performs well it’s some 5-points behind the similarly specified sensor in the Sony Cyber-shot DSC-RX10, suggesting that if it’s not the same then it’s a closely related unit. Low-light capabilities are practically identical but there is some advantage in color depth and dynamic range, with the Sony up to +0.3 Ev ahead in the former and nearly a +1 Ev advantage with the latter (at base ISO). 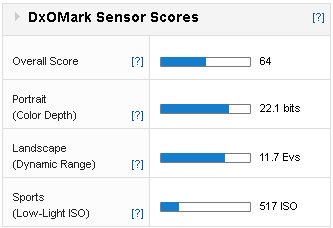 Although the Sony has slightly better high ISO performance (due to smoothing), it performs similarly to the Panasonic. 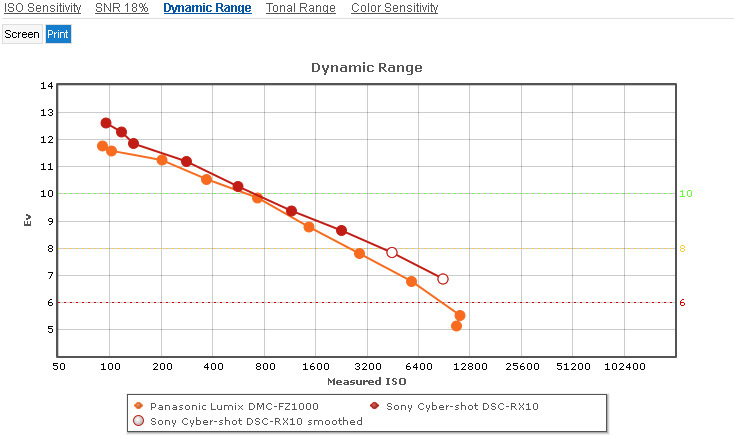 The most significant difference between the performance of the two can be seen in the dynamic range. There’s nearly +1 Ev advantage to the Sony at base, and the gains are not just limited to that setting either. With Sony being extremely competitive in so many markets simultaneously, it’s hardly surprising to see competitors start to hit back. The Panasonic DMC-FZ1000 is unashamedly targeting the RX10, which was a unique proposition. While the Sony remains tempting for its high-speed constant aperture zoom, the Panasonic’s extra reach, 4K video capture, similar (if not quite as impressive) sensor performance and slightly lower price means it’s a strong contender in this new class of camera.